Welcome to TEE-QUILTS.com, where each quilt is created by hand. Wrapping up in memories for 25 years! Collect your favorite t-shirts to create a unique memory quilt. A Tee-Quilt is a great way to save t-shirts from your cycling, running, or other athletic events, school activities, concerts, and vacations. Or what about a quilt customized for a loved one to celebrate Christmas, Mothers Day, Fathers Day, or graduation? 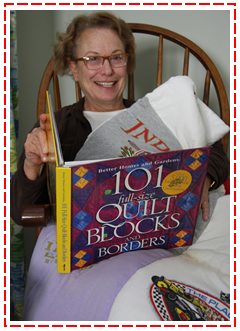 Wrap up in a Tee-Quilt and show off your quilt on FaceBook! "As of June 2019, I will have been in business for 25 years, reusing your t-shirts to make customized quilts. I continue to personally make your t-shirt quilt myself. If you live in the Indianapolis area, I will be happy to meet with you and lay out your quilt in my home. If you live outside the Indianapolis area, please mail your shirts to me." So far, I have sewn more than 1,600 tee-quilts! That's thousands of your t-shirts sustainably repurposed!